N64 The Legend of Zelda: Ocarina of Time (USA v1.0) in 2:33:24.72 by GuanoBowl. In the revolutionary 3D debut for the Legend of Zelda series, Link must travel around the colourful land of Hyrule and awaken six Sages in order to save it from the evil Ganondorf. This movie uses a variety of sequence breaks and shortcuts to complete the game using a minimal number of inventory and quest items. 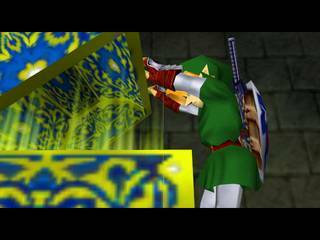 Even the most experienced OoT players are sure to find surprise in what is skippable in this game. NOTE: There is a short delay in the game every time the pause menu is entered. The delay is a known bug in the emulation and can't be avoided. JXQ has provided some interesting commentary on the movie, which might make it more entertaining. This movie is the "granddaddy" of all commentaries.